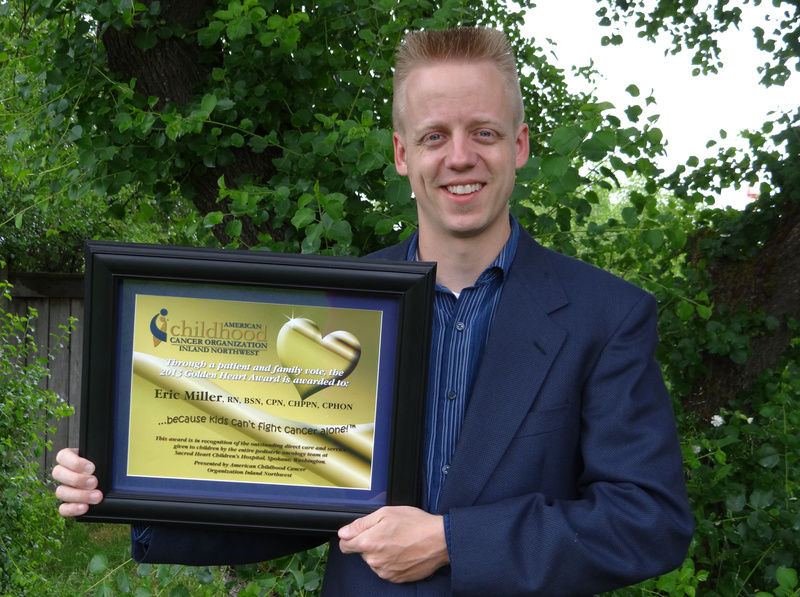 Providence Sacred Heart Children’s Hospital nurse Eric Miller was awarded the first Golden Heart Award. To learn more about American Childhood Cancer Organization Inland Northwest visit www.acco.org/ inlandnw or call (509) 443-4162. As a child, Eric Miller was always checking out anatomy books. He would read through them learning as much as he could about the human body, so no one was surprised when he said he wanted to be a doctor. Yet life rarely follows a straight path and Miller, who became a Christian at 17, instead became a children’s pastor who occasionally thought of medicine. Today, Miller is a pediatric oncology nurse at Providence Sacred Heart Children’s Hospital, and he is the recipient of the first Golden Heart Award presented by the American Childhood Cancer Organization Inland Northwest. It was initially very difficult for him to accept the award. Miller said he feels very strongly that any number of people he works with deserve the award just as much as he does. Miller, 36, is married to Jenna Miller and the couple have five kids. The family lives in Otis Orchards. Their oldest son, Micah, died when he was just 16 months old in 2003 shortly after the couple had moved to Spokane. Miller was carrying Micah on his back in a child carrier when the two were struck by a van. A self-described night owl, Miller works the night shift, and he has been at Sacred Heart Children’s Hospital for six years. His patients range from newborns to young adults. Oncology is about many other things than chemotherapy. It also includes treating side effects from medication and other medical issues that come up during treatment. And it’s not just about the patient. American Childhood Cancer Organization Inland Northwest – formerly known as The Candlelighters – has been around for more than 30 years. Started by a group of parents with children who had cancer, ACCOIN provides practical and emotional assistance to children with cancer while they are undergoing cancer treatment. “They do so much for the children,” Miller said. Mary Anne Ruddis, executive director of ACCOIN, said the idea behind the Golden Heart Award is to recognize those who do the hands-on work with children with cancer and their families. Parents and children were handed a simple ballot and asked to pick no more than three “favorite people” at the oncology unit, and that’s how Miller was picked.